Although bees and wasps are a little scary because of their stinging capabilities, they are actually quite valuable to both humans and the environment. It is understandable that you want to get rid of any bees or wasps if they pose a threat to your Andover, MN home and loved ones. But there are many, many documents proving that their ability to help pollinate plants is well versed. In addition, bees and wasps tend to eat many insects and pests that can kill crops, gardens and landscape plants. The honey bee is furry (short hair) and typically an amber to a brown translucent color alternating with black stripes. These bees are gentle in nature. They look towards pollen and nectar from flowers for food. The honey bee can only sting once, as it’s stinger is barbed. They live in large colonies of flat wax-based honeycomb which usually hangs vertically. The bumblebee is furry (long hair) and appears yellow with black stripes (sometimes with a red tail). The bumblebee also has a gentle behavior and searches for pollen and nectar from flowers for food. The bumblebee can only sting once. They live in small cavities in the soil. 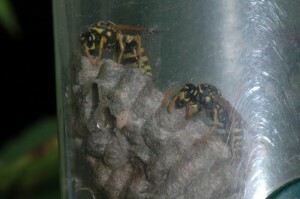 The yellow jacket is black and opaque with bright yellow stripes and have little to no hair. Yellow jackets have an aggressive temperament and eats other insects, overripe fruit, sugary drinks, human food / food waste, and meat. They have the ability to sting repeatedly, as its stinger is smooth. Yellow Jackets live in small umbrella-shaped papery combs hanging horizontally in protected spaces such as attics, eaves or soil cavities. Paper wasps are dusty yellow to dark brown or black and have little to no hair they are gentle in nature and like to eat other insects. Paper wasps have the ability to sting repeatedly. They live in a similar habitat as yellow jackets. The best way to get rid of a bee or wasp nest is to seek professional pest control help, especially if you are allergic to them. Sometimes the nests can grow very large which can lead to an attack. Our professionals at Eco Tech have the right skills, tools and knowledge in order to safely remove the nest and infestation quickly and naturally. We also complete treatments that are environmentally friendly, keeping your family, pets and the environment free from harm. Don’t risk getting stung! Call Eco Tech today at 763-785-1414 today!